This is a quick little recommendation for Goon, a comedy about a hockey fan who becomes an “enforcer,” a player whose primary skill is fighting rather than playing hockey. Seann William Scott is well cast as Doug, a gentle soul trapped in the body of a scrapper. His father (Eugene Levy) and brother (David Paetkau) are successful doctors. There is pressure from his family and synagogue to “succeed,” but so far he has only managed to become a bouncer. He’s a hockey fan, but not as rabidly as his best friend Ryan (Jay Baruchel, who also produced and cowrote) who runs a hockey-themed video blog. Together they attend games of the small-town league where fights are so common that the goalies sit down and rest while the enforcers go at it. The movie probably works so well because Doug is such a loveable guy. He’s a quintessential idiot, failing to deliver witty rejoinders, and misunderstanding subtle jibes. He makes up for it with an unflappable politeness toward everyone. When his love interest Eva (Alison Pill) is introduced, his decency and chivalry shine. But when his job calls on him to knock someone unconscious on the ice, that’s what he does. Adam Sandler’s earlier work shows a man-child split between angry violence and gentle decency (see The Waterboy or Happy Gilmore), but Scott pulls it off just as well and with a lot more charm. As cinema, I’m not sure if Goon is any great shakes. But as entertainment, it delivers perfectly on what it promises. 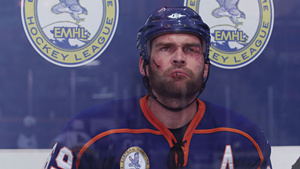 If you have a soft spot for sports movies and aren’t completely turned off by a little blood on the ice (I’m looking at you, Andrea), then make a date to see Goon.